Many bands have been influenced and shaped by Incantation over the years yet very few have managed to equal their music and fewer still will ever come close to matching their achievements. Their first album “Onward to Golgotha” was released in 1992 and to this day is regarded as a classic album, a true founding block of the sub-genre that has easily stood the test of time whilst also being an influence on so many Death Metal bands ever since. Onward to Golgotha brought Incantation to a worldwide audience almost twenty three years ago yet just last year they released their tenth studio album “Dirges of Elysium” which was an absolute smasher. It was also an album that many rated very highly, it was my first ever 10/10 review for The Lair of Filth and one of my albums of the year. Dirges… stands as a true testimony to Incantation - showing they can still write and release music of such a high calibre so far into their career, time has not dwindled nor diluted their aggression and hunger whatsoever. Onward to Golgotha may have catapulted Incantation towards a well-deserved wider audience but it was the Entrantment of Evil MLP that first set them on the road to legendary status. Following two demo releases, Entrantment of Evil was released in 1990 on 7” vinyl by Seraphic Decay Records and re-pressed a year later by Relapse Records, again as a 7” single. The good news for us is that Hell’s Headbangers has just released Entrantment of Evil for the first time ever on 12” vinyl and thankfully we now have a chance to own this very significant piece of Death Metal. Along with the original four tracks this 12” features a bonus track, Profanation and also includes exclusive silkscreened art on the B side. Also worthy of note is the fact this is the only non-demo Incantation recording to feature Will Rahmer from Mortician performing vocals. In terms of production it’s to be expected there’s a significant difference between recent releases and Entrantment of Evil, with Entrantment obviously sounding more raw and primal. However this rawness is part of the attraction, that and the standard of music during which you can easily hear the Incantation of today. This is history in the making and you want it to sound exactly like it did in the first place. Raw and laced with their trademark atmosphere of blasphemy and evil this is Death Metal as it was always intended to sound. A little rough around the edges yes, but see this as positive. 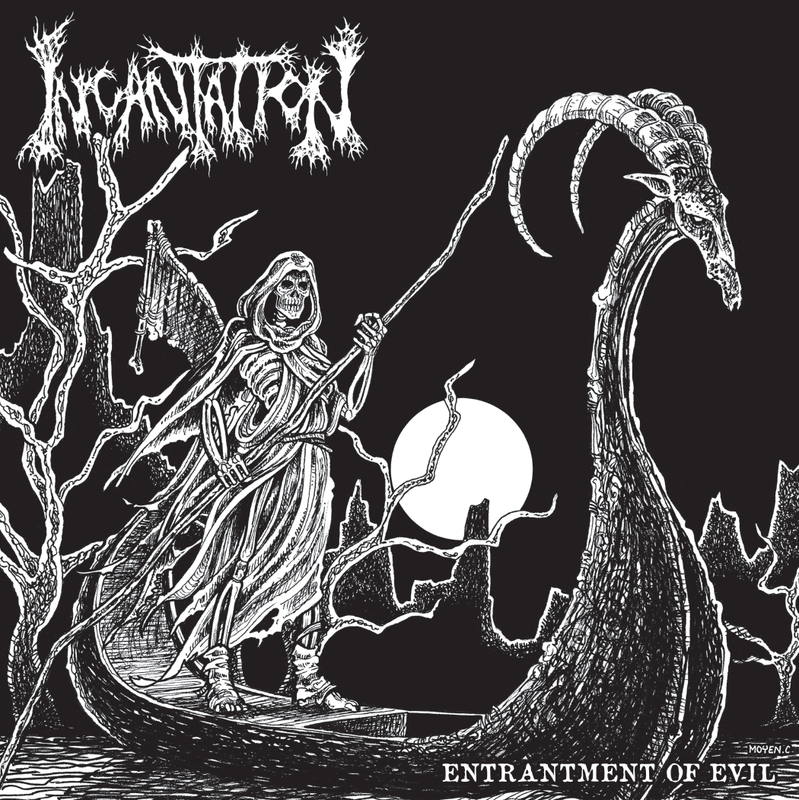 Bonus track, Profanation, was the opening track on both Incantation demo releases and is a tasty inclusion for completists. As well as being a chance to own some outstanding death metal on vinyl for the first time in almost twenty five years, it’s also a chance to own a piece of history and as such is an essential purchase for any Death Metal fan. 1 - Entrantment of Evil. 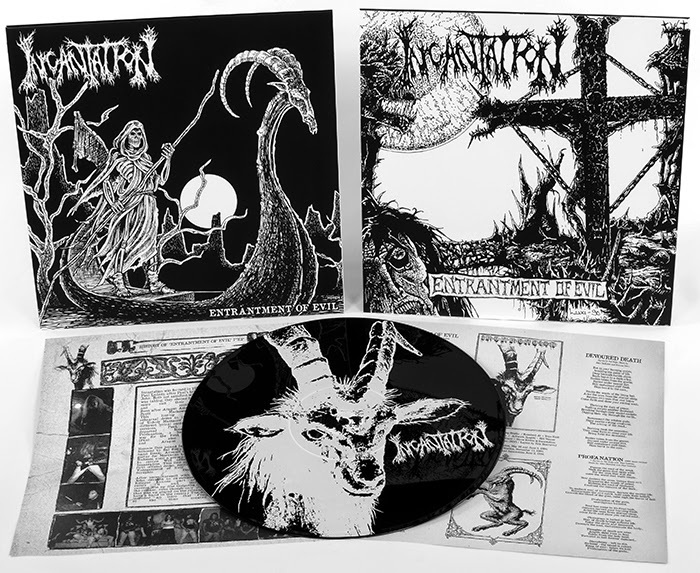 Incantation - Entrantment of Evil MLP is available now from Hell’s Headbangers.